To anyone who enjoys watching blackhead removal videos, spotting a new spot might actually be a thrill. But for most people, blackheads are a source of annoyance or embarrassment. They're formed when oil and skin cells get trapped in the pores and are exposed to air, which turns these little plugs brown or black. Banish blackheads at home, or pay a pro to do it – either way, getting rid of these unsightly spots is pretty simple. 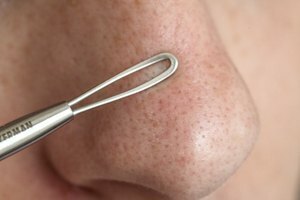 Blackheads tend to be stuck in the pores, so they don't pop out easily. Squeezing, pinching or digging at the pores to remove them may cause redness and irritation or even scarring. Protect the skin by taking steps to soften those blackheads and make them easier to remove. Dermatologists often recommend topical products that include either salicylic acid or retinoids. Both are effective in clearing the pores of anything trapped in them. They don't bust blackheads overnight, though. Apply a topical product made with one of these ingredients every day – or every few days, if mild irritation occurs – for at least a week. A word of caution, though: These products may not be safe for pregnant women. Talk to your OB/GYN before using them. 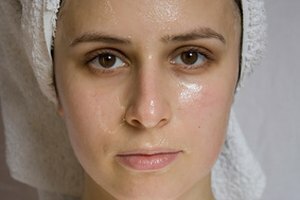 For blackhead sufferers who prefer to avoid harsh chemicals, use steam to soften them. Fill a bowl with hot (not boiling) water. Hold your face several inches above the water and drape a towel over your head and the bowl to trap the steam near your face. Stay put for five minutes, or longer if it feels comfortable. Steam alone won't dissolve blackheads, but should make them easier to pop out. The best way to get rid of large blackheads is to have a dermatologist or a licensed esthetician remove them. (Extractions, or the cleaning of clogged pores, are a standard part of most facials.) That service can be expensive, though – which is why so many people end up doing blackhead removal themselves. Pick up a comedone extractor from a beauty supply store. It's a simple tool that dermatologists and facialists use for this purpose, and it's easy enough to use at home. If that's not an option, grab two cotton swabs or, in a pinch, a tissue. Never try to remove blackheads with just your fingers; that introduces bacteria into the open pore. Ideally, set up in a place that has bright lighting and a magnifying mirror. The more clearly you can see what you're doing, the less damage you'll do. Using clean hands, grab the comedone extractor. Place the small metal loop at one end of the tool around the blackhead and gently push down. Alternately, press the cotton swabs on either side of the blackhead and gently push, or wrap the tissue around the index fingers and use them to press on the skin. Putting pressure on the skin around the blackhead should push the clog up and out. Use a clean tissue to wipe away whatever's released. If stubborn blackheads remain, repeat the steam treatment and try again. Finally, check the packaging of all your current skincare products to make sure they're non-comedogenic, meaning they won't clog pores. That, plus continuing to use products containing salicylic acid and retinoids (again, only if you're not pregnant) should help to prevent further blackhead outbreaks.